Trent Nunemaker, President of Snohomish County Fire District 19 in Washington USA, was strongly opposed to buying a hovercraft. He felt it would be too expensive and too much trouble for his department. But just like so many budget-conscious fire departments and rescue organizations who now employ hovercraft, Trent’s stance has completely reversed. He now says hovercraft are the best tool he’s found to save time, save lives and keep his first responders above the danger, not in it. What changed his mind? Training at HTC! 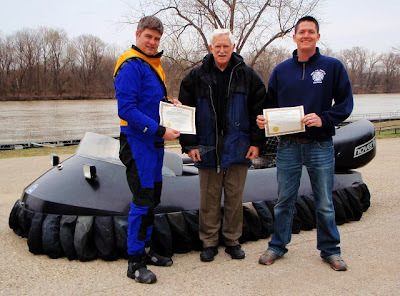 hovercraft pilot certification at HTC from instructor Chris Fitzgerald (center). Trent has some flying experience, but he says HTC training is vital for mastering hovercraft-specific techniques. "As far the techniques we used, I don't know if I would have been able to come up with them on my own. Like the 180. We use that maneuver when we're coming downriver so we can tuck inside logjams rather than making a wide sweep." He also credits HTC maintenance training for enabling his team to keep their hovercraft running at peak performance in-house, without having to pay for outside mechanical help. In fact, “We based our maintenance protocol on the Hovercraft Training Center checklist,” he says. 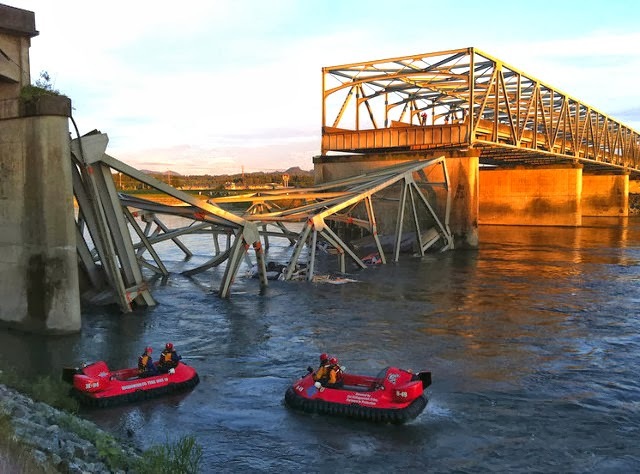 The Fire District 19 hovercraft definitely proved its worth after a major bridge collapsed last spring on Interstate 5 just north of Seattle. Two Neoteric hovercraft, one operated by Trent, cruised through the debris, searching for survivors. “Boats weren’t able to get into the wreckage, but we were able to hover back and forth through the debris and look for victims,” Trent says. Two Neoteric hovercraft survey the scene of the bridge collapse on the Skagit River near Seattle, Wash. 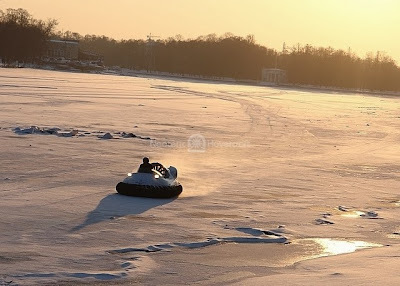 In many parts of the world, winter is just around the corner – but Hovercraft Training Centers offer a sure-fire cure for cabin fever! 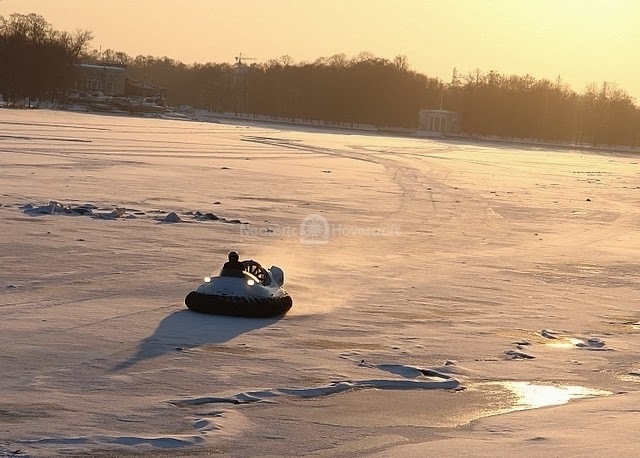 You may have to stow your jet ski, fishing boat, canoe and ATV for the cold season, but a hovercraft will keep you soaring throughout the year. Snowstorm? Thin ice on the river? Broken ice on the lake? Never a problem! A Neoteric hovercraft flies over thin, broken ice on St. Petersburg Harbor in Russia. There’s no greater way for outdoor lovers to dump the winter doldrums – come take a Hovercraft Training Centers Test Flight and see for yourself!